A tragic hero is a character in a work of fiction (often the protagonist) who commits an action or makes a mistake which eventually leads to his or her defeat. The idea of the tragic hero was created in ancient Greek tragedy and defined by Aristotle (and others). Usually, this includes the realization of the error (anagnorisis), which results in catharsis or epiphany. The modern use of the term usually involves the notion that such a hero makes an error in his or her actions that leads to his or her downfall or flaw. The idea that this be a balance of crime and punishment is incorrectly ascribed to Aristotle, who is quite clear in his pronouncement that the hero's misfortune is not brought about "by vice and depravity but by some error of judgment." In fact, in Aristotle's Poetics it is imperative that the tragic hero be noble. 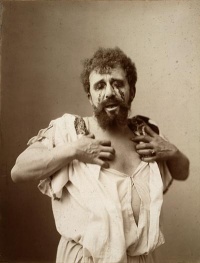 Later tragedians deviated from this tradition: the more prone the tragic hero was to vice, the less noble and the less tragic, in the Aristotelian sense of the word, the tragic hero happened to be. Tragic heroes appear in the dramatic works of Aeschylus, Sophocles, Euripides, Seneca, Marlowe, Shakespeare, Webster, Marston, Corneille, Racine, Goethe, Schiller, Kleist, Strindberg, and many other writers. The defining characteristic of a tragic hero, esp. in the Hellenic dramas, is Hamartia. The hero discovers that his downfall is the inevitable result of his own actions, not by things happening to him. The hero's downfall is understood by Aristotle in his Poetics to arouse pity and fear that leads to an epiphany and a catharsis (for hero and audience). It is not necessary by the Aristotelian standard that the downfall or suffering be death/total ruin, as in the myth of Herakles, who ultimately ascends to Mount Olympus and immortality. Since at least the time of William Shakespeare, however, the flaw of a tragic hero has generally been regarded to necessarily result in his death, or a fate worse than death. The Shakespearean tragic hero dies at some point in the story; one example is the eponymous protagonist of the play Macbeth. Shakespeare's characters show that tragic heroes are neither fully good nor fully evil. A tragic hero is often of noble birth, or rises to noble standing (King Arthur, Okonkwo, the main character in Chinua Achebe's novel Things Fall Apart). The suffering of the hero is meaningful, because although the suffering is a result of the hero's own volition, it is not wholly deserved and may be cruelly disproportionate. John Proctor, a major character in "The Crucible"
There may sometimes be supernatural involvement (in Shakespeare's Julius Caesar, Caesar is warned of his death via Calpurnia's vision and Brutus is warned of his impending death by the ghost of Caesar). The hero's misfortune is not wholly deserved. In the modernist era, a new kind of tragic hero was synthesized as a reaction to the English Renaissance, the Age of Enlightenment, and Romanticism. The modern hero, rather than falling calamitously from a high position, begins the story appearing to be an ordinary, average person; for example, Truman Capote's fictionalized version of Perry Smith in In Cold Blood. Also, Arthur Miller's Joe Keller in All My Sons (1947) is an average man, which serves to illustrate Miller's belief that all people, not just the nobility, are affected by materialistic and capitalist values. The modern hero's story does not require the protagonist to have the traditional catharsis to bring the story to a close. He may die without an epiphany of his destiny and he may suffer without the ability to change events that are happening to him. The story may end without closure and even without the death of the hero. This new hero of modernism is the antihero and may not be considered by everyone to even be a tragic hero. Unless indicated otherwise, the text in this article is either based on Wikipedia article "Tragic hero" or another language Wikipedia page thereof used under the terms of the GNU Free Documentation License; or on original research by Jahsonic and friends. See Art and Popular Culture's copyright notice. This page was last modified 13:08, 22 February 2014.